You don’t need much space or fancy patio furniture to turn an outdoor area into an inviting spot for enjoying a meal outside. A few chairs drawn up around a cafe table under a shade tree, or benches and a folding table on a roof terrace, are all it takes to create an alluring destination. Let’s take a look at 8 inspiring dining table and seat combinations for making the most of dining under the sky. 1. Carefree retreat. Pair retro industrial metal chairs with an all-purpose metal-topped table for an outdoor dining setup that not only looks stylish but is weatherproof and easy to clean too. While we most often think of industrial-style furnishings in contemporary backyards, they can work just as well in more traditional landscapes, adding structural balance to loose, easygoing plantings and colorful flowers. 2. Meadow hideaway. If your outdoor table is positioned in a standout garden setting, keep all attention on the beauty of the landscape with an understated outdoor dining setup. 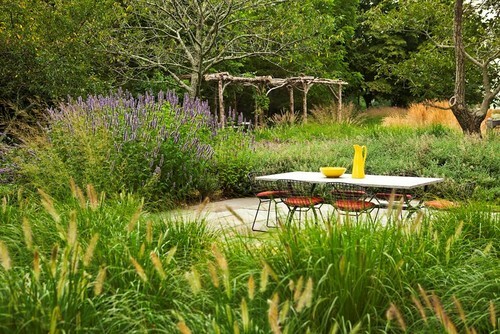 For example, in this backyard in upstate New York, simple low-backed metal chairs and a sleek outdoor table nearly disappear from view among a stunning meadow planting of billowing ornamental grasses and flowering perennials. 3. French-style courtyard. Outdoor dining furniture, with the help of a few other elements, can be an opportunity to define the style of your garden or patio. 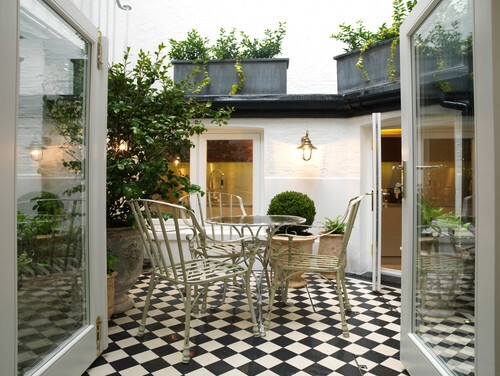 For a romantic French-style terrace, for example, look for metal bistro chairs and antique outdoor tables to set the mood. Further the style with accents like traditional terra-cotta pots, trimmed boxwood globes, a stone fountain, metal lanterns and potted Mediterranean herbs. 4. Backyard barbecue. If you’re adding a new outdoor dining setup to your backyard but can’t decide where you’d like to put it, think about where guests naturally congregated at your last backyard bash. Were they drawn to a sunny spot at the back of the yard, or did they end up clustered around the outdoor grill? Chances are, the best place for your outdoor table is close to the house and right up where the action is. 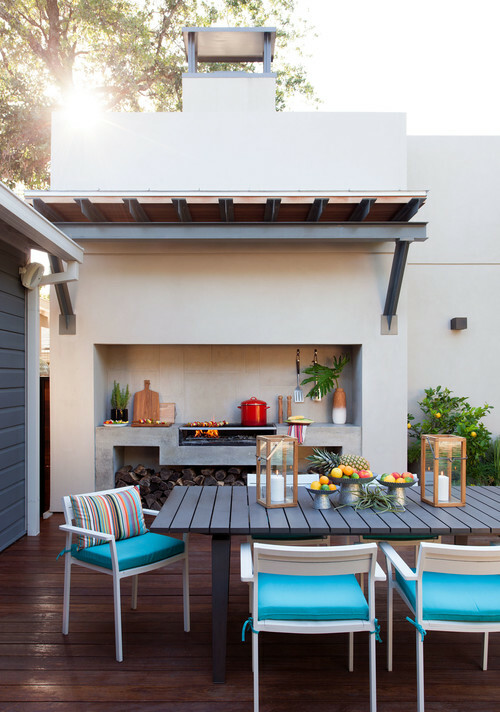 For example, in this Austin, Texas, backyard, the dining table is close to the grill — perfect for passing a kebab straight from the fire to the plate. 5. Vine-covered patio. Enjoy dining or relaxing outdoors under the leafy boughs of evergreen vines and fragrant climbers. 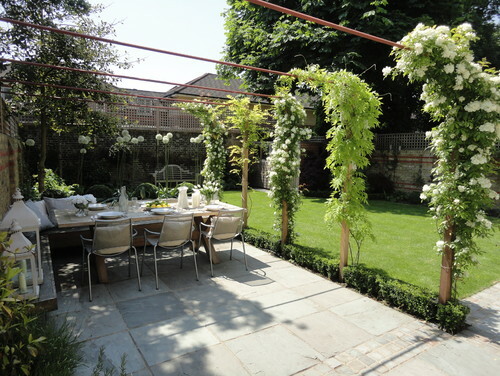 In this London backyard, the designer used a series of trellises, topped with fragrant wisteria and white-flowering climbing roses, to cast shade over an outdoor dining table. When choosing vines to plant over a trellis, consider whether you’d like them to provide shade, fragrance, color, fruit or all four to enhance your outdoor dining area. A few top choices include clematis, climbing roses, grapevines, chocolate vine (Akebia quinata,USDA zones 5 to 9; find your zone), honeysuckle (Lonicera sp. ), wisteria and potato vine (Solanum crispum). 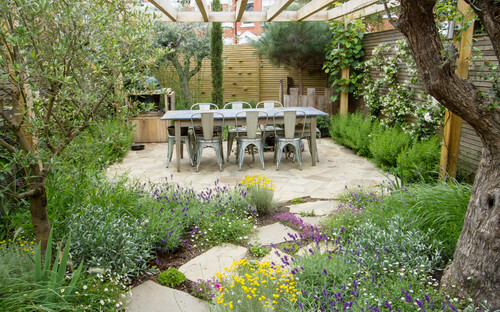 The table and chair combination in this backyard also cleverly increases flexibility. Set in the corner by the L-shaped built-in benches, the wooden table feels pleasantly tucked at the back of the stone patio, perfect for a dinner party of six. Pulled out to occupy the center of the patio, the table (plus more chairs) could seat eight people, with the option to seat more on the bench seats. 6. Rustic terrace. 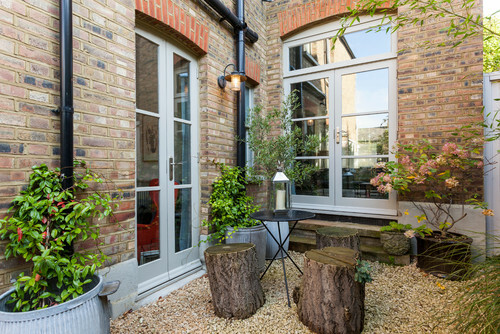 To give a small-scale outdoor eating area a dose of woodland charm, swap folding chairs for tree stump stools. If you’re making your own (or asking for them from a local tree removal company), keep in mind that for comfortable seating, you’ll want a stump that’s 17 to 19 inches tall with a cut at the bottom to prevent wobbling. 7. Corner booth. Just like the coveted dining spot in your favorite restaurant, a garden booth can increase intimacy and a sense of seclusion while you’re dining outside. 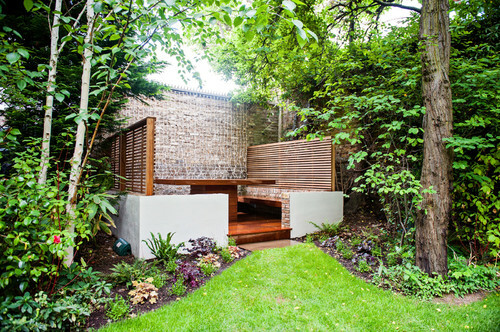 In this London backyard, a booth constructed of a brick base, raised deck flooring, slatted wood seat backs that double as privacy screens and wooden bench seating form a private corner nook for hosting dinner. A couple of seat cushions and throw pillows would make the space even more inviting. 8. Lofty perch. More so than furniture in other outdoor areas, tables and chairs on the rooftop really take a beating. Choose materials like treated metal and heavyweight teak that can withstand prolonged exposure to sun and moisture — or pick lightweight, collapsible furniture that’s easy to move. 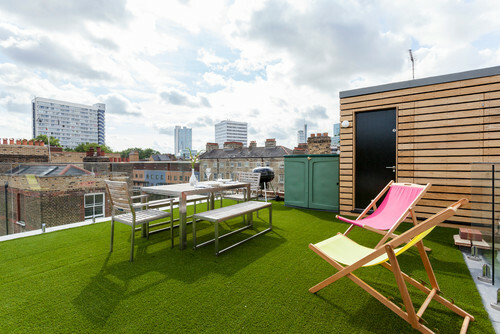 This sunny rooftop terrace in London relies on a combination of both. The metal-and-wood table and benches can hold up well to weather without warping or otherwise showing damage. The colorful slingback lounge chairs are more fragile but are easy to move inside over the winter.